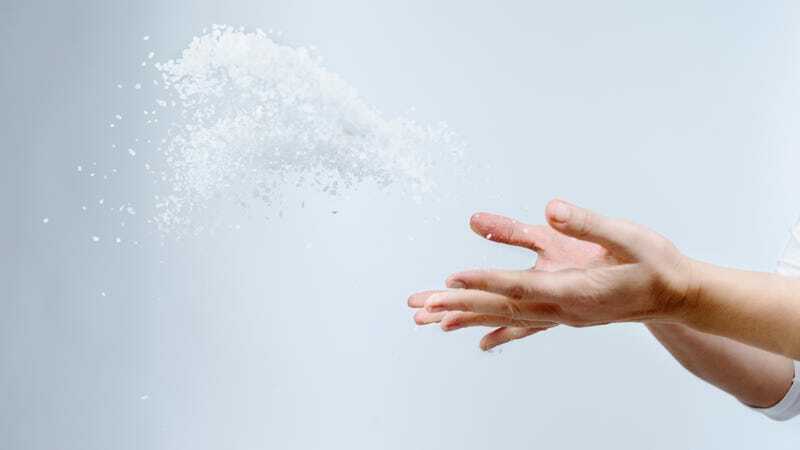 TIL: Why do we throw salt over our shoulders? It’s Friday The 13th, so while I don’t hide under my bed all day or anything, I do keep things pretty much on the downlow. I probably wouldn’t plan a party on Friday the 13th, let’s put it that way. So while I’m not usually a superstitious person, I do adhere to certain traditions. For example, I don’t walk under ladders, which just seems like a good idea in general. And I throw salt over my left shoulder when I spill it. But today’s holiday made me wonder, why do I do such a fool thing? According to The Encyclopedia Of Superstitions by Edwin and Mona A. Radford, the power attributed to salt is because it is so tied to formidable elements like the ocean, or our own sweat and tears. Even our bodies contain one percent salt. Ramford says, “The devil is believed to detest salt, as it is incorruptible, immoral, and linked to God. If a superstitious person accidentally spills some salt, he must immediately throw a pinch over his left shoulder. This is because the devil is likely to attack from the rear, and will also attack for the left, or sinister side. The presence of salt will immediately scare off the devil before he has time to cause any difficulties.” Good to know: Take that, Satan! Even Leonardo Da Vinci used the salt superstition in his seminal work The Last Supper: Judas knocks over the salt cellar, a clear indicator of his oncoming betrayal, which will lead the way to Christ’s crucifixion. Another The Encyclopedia Of Superstitions, this one by Richard Webster, offers a strange superstition only performed on the Isle Of Wight at Halloween. In the bedtime ritual, “Each member of the household before going to bed was given a thimbleful of salt. The contents of the thimbles were then turned out in neat piles on a plate and left there overnight. Next morning the piles were examined, and if any of them had fallen down, he or she, who it represented, would die within the year.” Y’know, that seems like a creepy superstition that can just easily be avoided altogether. I’ll probably keep throwing salt over my shoulder just to be on the safe side. Ask The Salty Waitress: Can I complain when our food doesn’t arrive all at once? Point/Counterpoint: Does mayo belong on a hot dog? Eat a tarantula burger and all you get is this lousy T-shirt?